With sales of Fireball Cinnamon Whisky rocketing nationwide and in Maine over the past 5 years, the spicy libation has bumped perennial favorite Allen's Coffee Flavored Brandy out of the top spot for best-selling liquor in Maine. 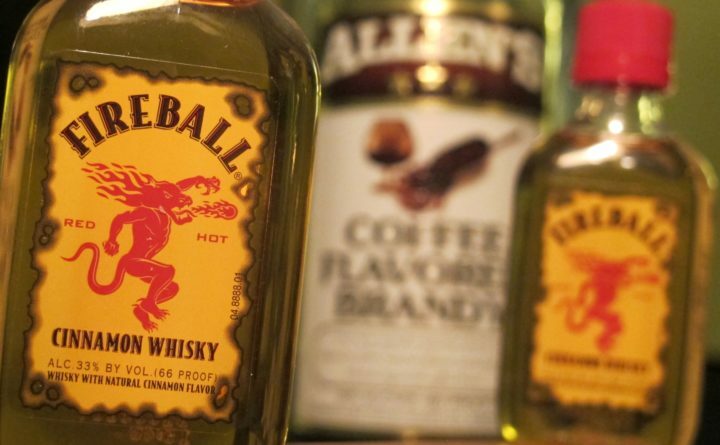 Fireball Cinnamon Whisky is now the most lucrative brand of booze in Maine, having outsold Allen’s by half a million dollars in 2018, according to data released Monday by the state. More than $10.1 million worth of Fireball was sold in Maine last year, including $4 million worth of the small, 50-milliliter bottles known as “nips.” Allen’s — nicknamed “the champagne of Maine” for having dominated liquor sales in both value and volume in the state for at least the past 15 years, if not longer — sold $9.6 million worth. The coffee brandy, which is made by M.S. Walker of Somerville, Massachusetts, has much smaller sales elsewhere in New England and virtually none outside the region. Its peak sales year was 2009, when $12.9 million of it sold in Maine. Last year was the first year since at least 2004 that its sales in Maine dipped below $10 million. Sales data in the state prior to 2004 are unavailable, though an M.S. Walker executive said Allen’s dominance in the Maine market stretches back to the early 1980s. And despite Allen’s falling into second place in terms of sales value, that executive Tuesday still staked out a claim for the coffee brandy as the highest-volume seller in Maine. Fireball sells a lot of very small bottles, but Allen’s sells higher quantities of actual liquor in the state, said Gary Shaw, M.S. Walker’s vice president of sales. The 900,000 bottles of various sizes that sold in Maine last year added up to nearly 94,600 cases of Allen’s. By comparison, Fireball sold roughly 54,000 cases. A case represents 9 liters of liquor, an industry standard. “We’ve always looked at volume,” Shaw said. Mike Jack, a bartender at the Thirsty Whale Tavern in Bar Harbor, said he has noticed more customers requesting Fireball in recent years. It used to be labeled “Dr. McGillicuddy’s Fireball Whisky,” and Jack said he started getting more requests for it when the company took the fictitious doctor’s name off the label and gave it a new design and marketing push. “All of a sudden, it’s liquid magic,” said Jack, who has been a bartender since the early 2000s. Conversely, he said he has noticed that he pours less Allen’s than he used to. He and his coworkers used to go through 2 or 3 half gallons of Allen’s in a week, he said, which is roughly the current pour rate for Fireball. Now, they may go through a liter a month. Allen’s decline in Maine’s market share is undeniable, said Gregg Mineo, director of the state Bureau of Alcoholic Beverages and Lottery Operations. Sales of 50-milliliter liquor bottles have become popular throughout New England, he said, and the lack of such an option for Allen’s likely has contributed to its slide. Also, many bartenders now promote themselves as “mixologists” and aim to make more complex cocktails for their customers, instead of pouring simpler drinks such as the sombrero, which is half Allen’s and half milk. “That’s part of this cocktail revolution,” Mineo said. Fireball’s sales skyrocketed in Maine after its 2007 rebranding and subsequent marketing push an aggressive promotion effort that started in 2010. In 2013, Fireball’s total statewide sales were $770,000 but they more than doubled in 2014 and again the following year. In 2016 and again in 2017, Fireball’s Maine sales increased by more than 50 percent. And Fireball is not alone in seeing its fortunes soar. Tito’s Handmade Vodka also has exploded in popularity in Maine and elsewhere, and ranked third in sales last year at $9.2 million. But the Massachusetts firm that makes Allen’s remains confident in the coffee brandy’s long-term future in Maine, Shaw said. It has not significantly raised the price of Allen’s, though other brands have raised theirs, and it doesn’t plan to, he said. It also intends to continue sponsoring events in Maine such as motorsports and bluegrass festivals, he added.